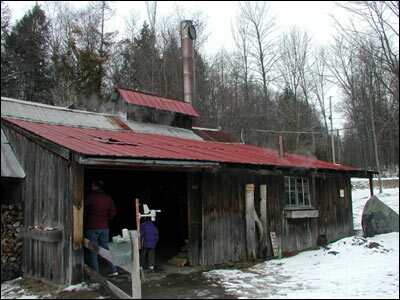 Vermont Sugarhouses are very active during the early spring when the sap is running and maple is produced. But most of the sugarhouses are also open to the public year-round. 500,000 times 40 means… heck, a darn lot of sap! The sap comes from a special type of maple called a… sugar maple – you probably guessed that already right? Maple syrup production goes on all over New England and Canada in the spring, and not just in Vermont. But for whatever the reason Vermont sets the standard and produces the finest in the world – Maple Syrup is only produced in the small Northeast corridor of North America, and nowhere else in the world. More than 200 years ago Native Americans showed early Vermonters the secrets of the sugar maple, and how to extract the sap and boil it to make syrup. Except for some equipment modernization the process hasn’t changed that much since those first lessons. Just about sometime in March when winter in Vermont is loosening its vice-like grip, and when the days get up in the 40’s but the night still freezes and the wind is from the west, the sap in the sugar maples begins to run. If the day stays too cold or gets too warm and the wind is from the south then the sugar makers know its wasted effort to try and tap. It used to be the sap was collected in buckets, and when full, emptied into a large tank and horse drawn to the sugarhouse. Today most sugarhouses use the more modern plastic tubing in the tap holes rather than buckets. This allows a more elaborate network of tubing to be inter-connected and makes collection of the sap to large tanks easy and cost effective. The tendency for Maple producers today is to reduce the amount of sap they take from each tree each season. A number of years ago the Maples begun to show signs of distress due to over tapping, and rather than run the risk of destroying the golden goose, farmers have cut back. This is pretty typical in conservation conscious Vermont. The sap once collected in the large tanks is dispersed to the tanks in the Sugarhouse. 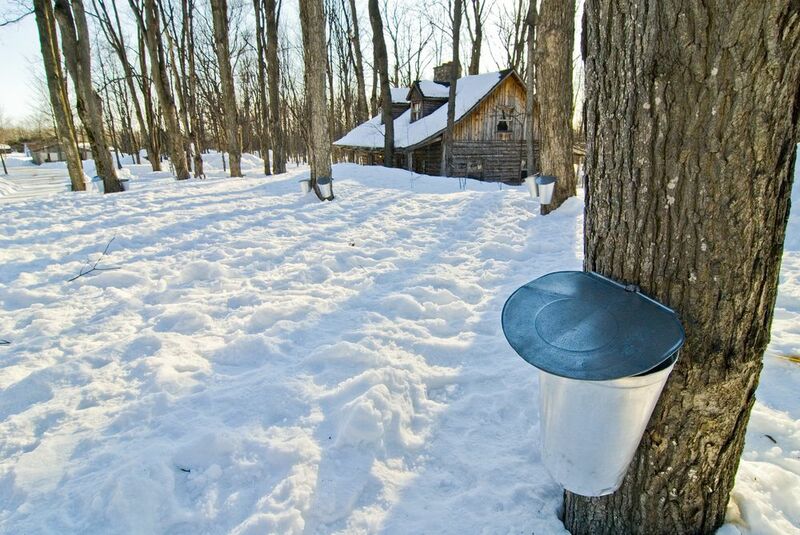 There’s just no time to delay in getting the sap to the house – it’s best turned to syrup within the first 24 hours. The sap is flowed into large trays with different compartments where the water is boiled off and eventually the syrup moves down the trays to the final tray where it’s syrup. The expert Maple producers can tell by just scooping up a ladle of the syrup and letting it flow back in whether the consistency is ready for it to be bottled. On a recent visit I bought a bottle while it was still warm and you bet I had pancakes within a few hours of purchasing it – can’t get much fresher than that! It’s no accident that the sugar maple is the official State Tree of Vermont. 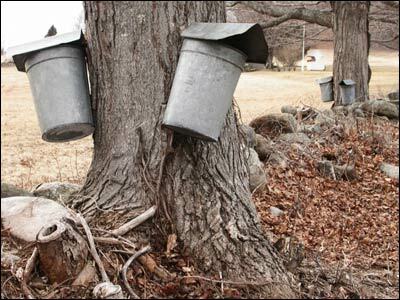 Maple sugarmaking is a Vermont heritage and the state has led the nation in the production of maple syrup for more than two centuries. The Vermont Legislature was also the first in the Union to pass a Maple Grade Law. The grade must be labeled on each container and consists of: Grade A: Golden Color & Delicate Taste – a delicate maple flavor and light in color, preferred as a gourmet choice for candies and other maple specialties. Grade A: Amber Color and Rich Flavor is the most popular choice for all around use especially pancakes. Grade A: Dark Color & Robust Flavor has a heartier flavor, but still a popular choice for the table. Grade A: Very Dark & Strong Flavor has the darkest color and strongest maple flavor, and mostly used for cooking. The grade of Vermont maple syrup reflects the stage in the season it was tapped. So “Grade A: Golden Color & Delicate Taste” grade is made from sap early in the season, and “Grade A: Very Dark & Strong Flavor” towards the end. So if you’re traveling in Vermont during early spring and smell the scent of maple sugar, and see the smoke rising from a sugarhouse then it’s time to take a break, and see maple syrup being made in a way that hasn’t changed much in over 200 years. Okay let’s get going with our list of Vermont sugarhouses for you to see on your Vermont vacation. Here you’ll find a list by region of Vermont sugarhouses open to the public. It’s always wise to call ahead or check out the web site for days and times just to be sure. While many Vermont sugarhouses still collect the spring sap in conventional buckets, lots of sugar farms now use plastic tubing networked from the trees to large collecting tanks. I’m glad to say either collecting method yields wondeful pure Vermont maple syrup. 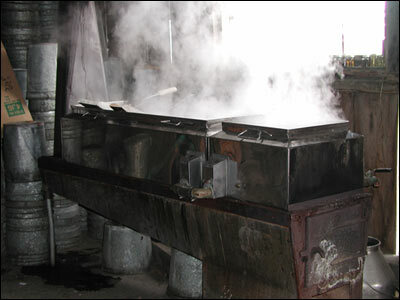 The device that turns sap into maple syrup is called an evaporator. Here you can see the different tray compartments where the rapidly boiling sap passes through, until all that's left is pure maple syrup, then it's bottled and ready for you to purchase when you visit a Vermont sugarhouse while on your vacation. Whether you take your trip to the sugarhouses of Vermont in the spring when the sap is running and see the equipment operating, or during the summer and fall to visit the farm and maybe sample and purchase some maple syrup products, plenty of famous Vermont lodging is always close. To discover where to stay deals, and compare rates and amenities with a trusted and professional travel organization then check out Vermont lodging and accommodations.